Still no passport, but I'm studying for an exam (on Monday!!!!!!!!!!!!!!!!!!!!!!!!!!!!!!!!) and then I'll take care of things. My mom's partner even offered to pay for it (which I gratefully accepted ...'cause...well..things are tight around here). Today I took this creature to the airport. 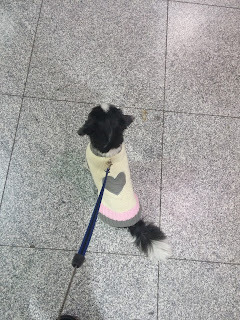 She has since learned that the airport is a very fun place and there is always something exciting happening there. She has no idea who she is waiting for, so she randomly decides on a few people and goes up to them like she hasn't seen them in five years....even though she's never met them before. It makes my heart happy...because I like to think what it would be like if that was my greeting when I came home after a long week away. Airports cause me stress. And bring me a lot of memories. It was an amazing time in my life....but it brings back memories that...are still bittersweet. My very first New Year's Eve in Quebec. It was...pretty magical. Maggie, me, the girls, and my ex-husband went to his mother's house where we met the entire family. Everyone was merry, even I was drinking some vodka and cranberry - sneaking the girls a little capful and laughing. I ate traditional ragu, double kissing everyone multiple times on the cheek (this was still very new to me and weird because in Alberta there is NO kissing on the cheek an in Madagascar it's three times). I loved the family dynamics, I loved the laughter, I loved the younger kids running around, I felt so complete. I had a family in Quebec. Another in Alberta. Another in Madagascar. Everything felt simple. I'm sure that everything wasn't as perfect as I remember. Life never is. But I think of times today. While I would love to see any of my....ex-Quebec family, it doesn't work that way. The family in Madagascar has changed into some amazing friends spread across the world. The family in Alberta has gotten smaller by two, but INCREASED by two amazing little children. But we are tense right now worried about two people in cancer treatment and one friend of the family on her last days. Things are going as well as they can, but it's a different kind of stress that we all try to understand but can't possibly, because it's just a weird thing. And me, in Montreal. With Maggie. I think about the girls quite often....since I watched them develop into beautiful women....but this will be my second Christmas without them, or their dad, who held a part of my heart....and randomly appears in my dreams from time to time. We aren't in contact and every so often, I wish him well in my thoughts, praying he is healthy and happy. Sometimes wishing I had read a book on how to divorce in hopes that ours would have went better. I guess the holidays are often emotional. I'm happy this year to be spending mine in Edmonton, staying with a friend, in the peaceful, quiet, "country". Which I need. Cause my nerves are a little fried and my brain is pretty tired. I need to be around some English speakers to get my vocabulary back. And just chill out a bit.